The MLHS Fine Arts Center Auditorium will be alive with The Sound of Music Nov. 17-19! The Sound of Music is a classic, popular musical featuring the famous songs “Edelweiss,” “Do-Re-Mi,” “My Favorite Things,” and the title song, “The Sound of Music.” Originally produced on Broadway in 1959 by Rogers and Hammerstein, this musical is based on the story of the Von Trapp family as told in the memoir of Maria von Trapp. Set in 1938, on the eve of the Nazi Anschluss, this story follows Maria, an outspoken young candidate nun who has taken a job as a governess to a family of seven children while she decides whether to pursue a life completely devoted to Godly service. This young woman, with a heart full of song and tenderness, grows to love the children she cares for as well as their widowed father, Captain von Trapp. With the Nazi threat growing, this family must escape the grasp of the Third Reich and find refuge. This heart-warming musical is filled with laughter and singing as it explores the serious themes of love, perseverance, and self-discovery. It contains something for every member of the family and is a wonderful story to experience. 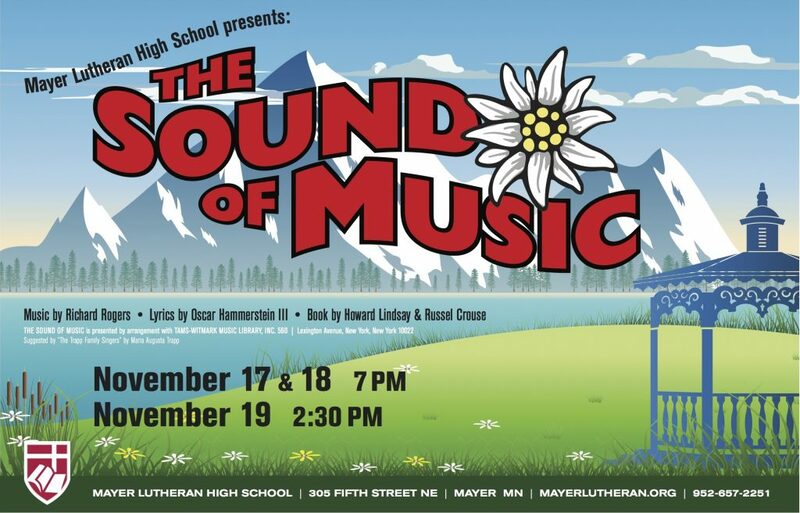 Performances of The Sound of Music will be held on November 17 and 18 at 7:00 pm, and 2:30 pm on November 19. Tickets are general admission, $10 for adults, $7 for students, and are available at the door. Please come and see this family-friendly, classic musical. Be a part of a night filled with music and fun, and get wrapped up in the story of The Sound of Music.